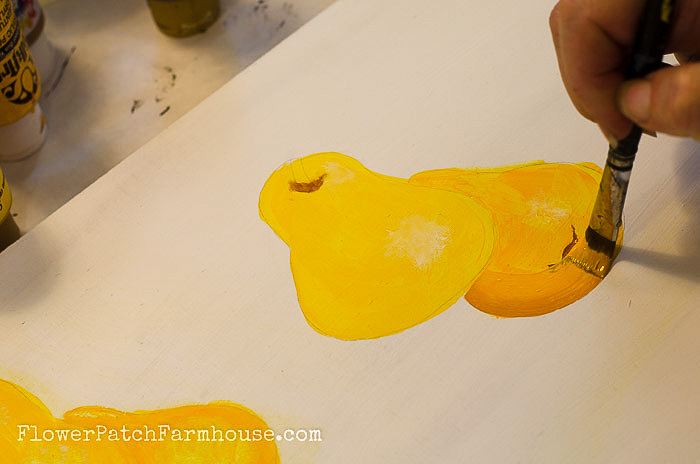 How to Paint a Pear in Acrylics, a step by step tutorial on with video. 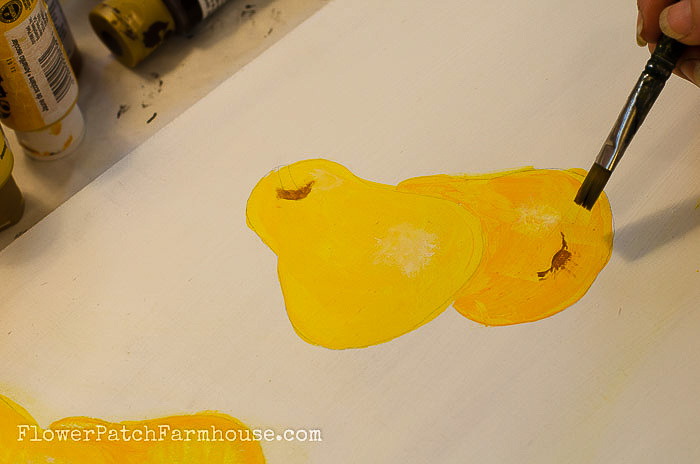 Pears are easy to paint and a great design to add to your artwork. 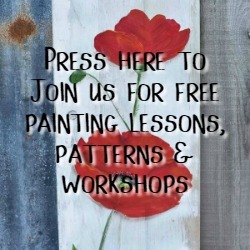 Come and enjoy painting pears with me. 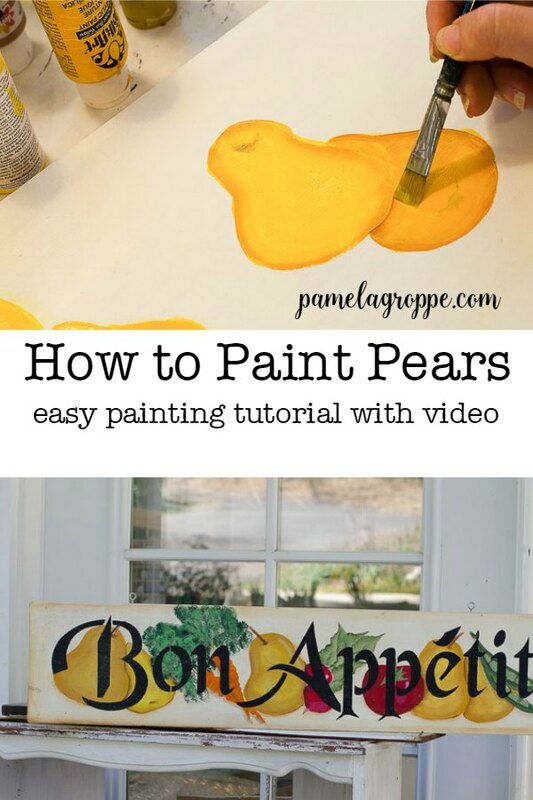 How to Paint a Pear in acrylics shows how easy it is to paint a pear or two. Use for vintage fruit stand signs, on kitchen decor or even a floor cloth. Just an example of how you can use your new painting skill, I have hung on to this sign while all my others have been sold. It is one of my favorites. 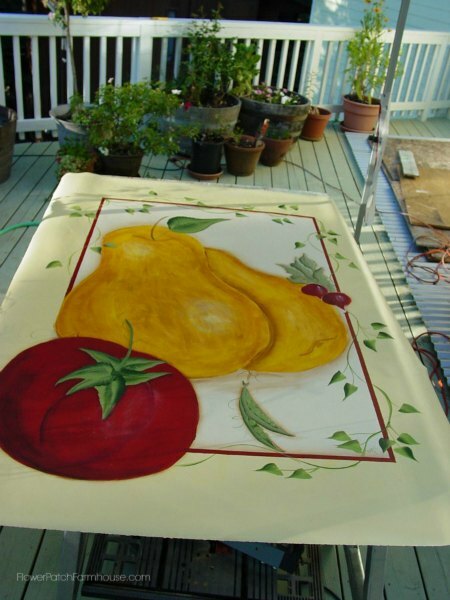 I am going to take you thru painting each of the fruits and veggies on the sign above, one at a time. 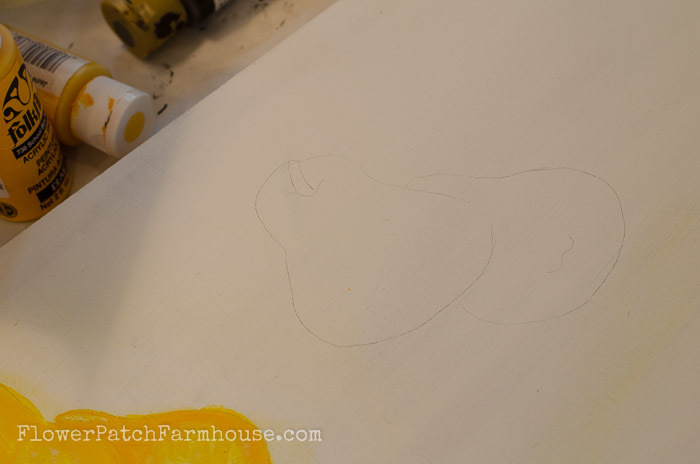 Today we start with How to Paint a Pear. 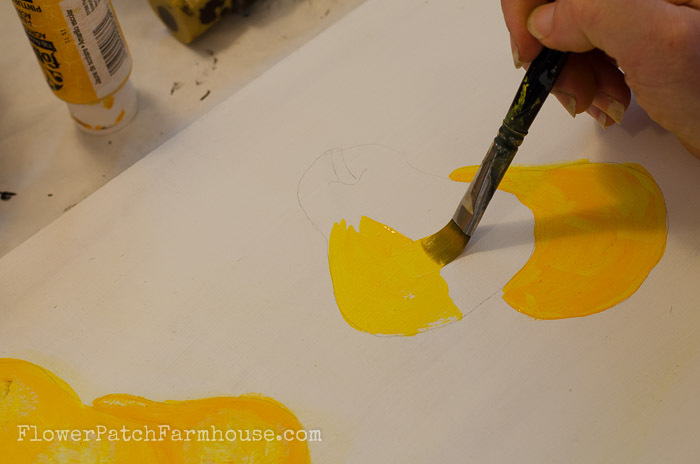 Yellows in bottled acrylics are not very opaque so we need to undercoat. Just stroke in the color. 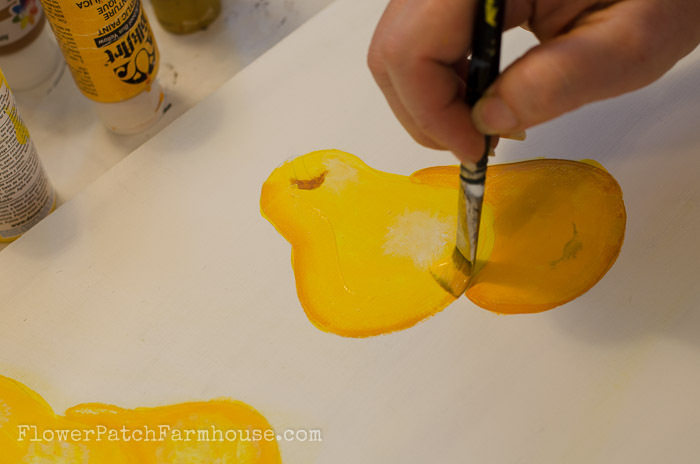 Here I used School Bus Yellow on the lower pear and Cadmium yellow in the upper..
Let them dry or you can speed up drying with a blow dryer set on warm. Add a touch of highlight by dabbing a corner of your cleaned brush in white and touching in the spot you wish the highlight to be. 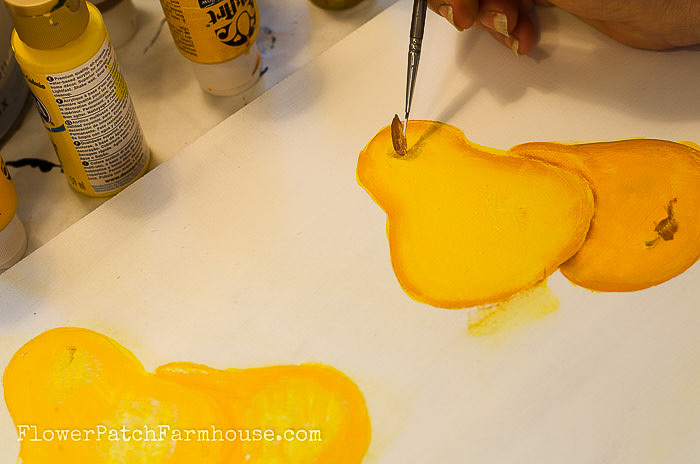 Then pull out the edges of the little spot with your brush to blend it in. I also highlight on the upper pear. Load a touch of Raw Sienna on a liner brush. I used a 10/0, stroke on the dimples or divets. 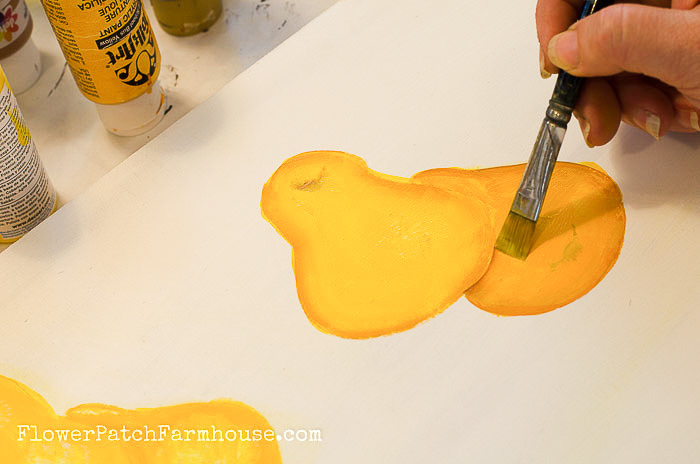 Double load your brush with School Bus Yellow and Yellow Ochre (or Antique Gold). With the Yellow Ochre side shadow along the outer edge of the lower Pear. 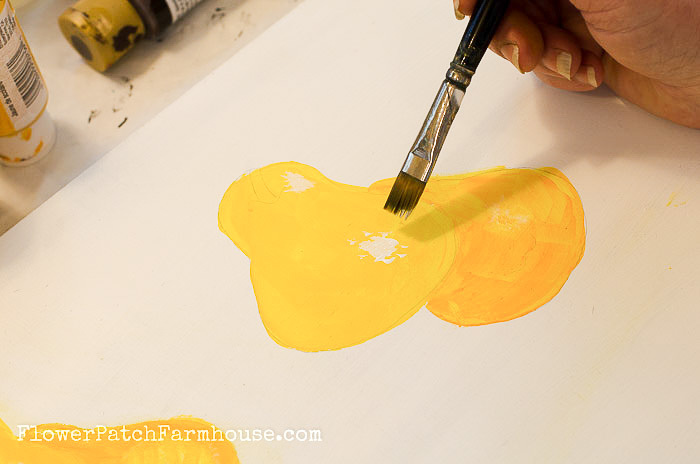 Clean the brush again, and double load with the Cadmium Yellow and Yellow Ochre. Shadow the upper pear by stroking the brush along the outer lines of the pear. 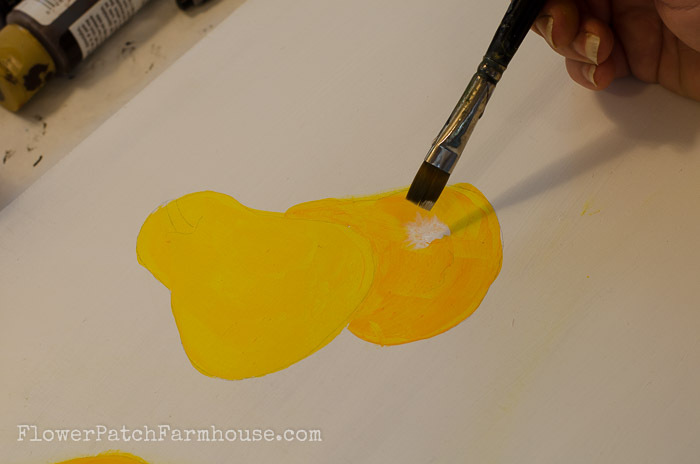 To create a shadow along the lower edge of the upper pear where it overlaps the lower one add a bit of Raw Sienna to the corner of your clean brush and stroke along the seam. You can redo your dimples if they were covered too much by the yellow being stroked over. Now add you stem with either the chisel edge of your flat brush or a liner brush and Raw Sienna or Burnt Umber. Highlight one edge with a touch of white. Keep in mind that pears come in many colors so feel free to switch it up, do green pears, or the reddish ones. Your pears should be done! 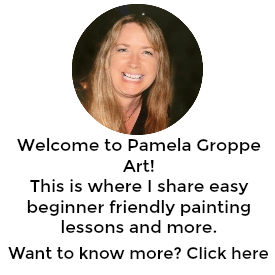 Want to get the pattern, sign up for my email newsletter and post updates to gain access to the Subscribers Only Resource Library of patterns. 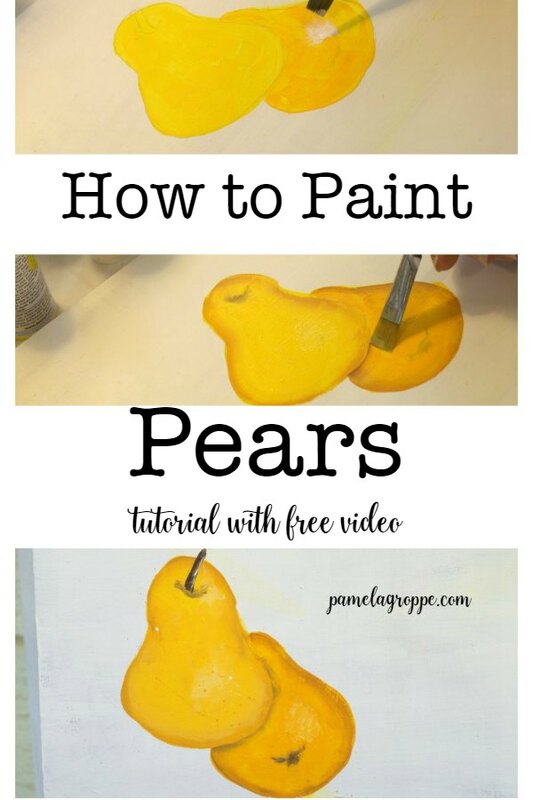 Here is the YouTube video of How to Paint a Pear. If you enjoyed this, please PIN and share..